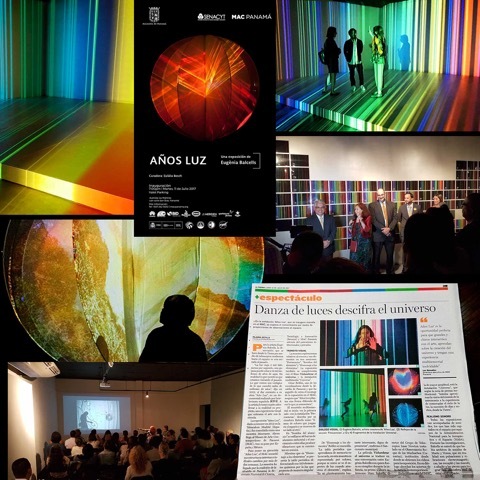 The art exhibit Light Years, of Catalonian artist Eugènia Balcells, filmed at the William Herschel Telescope, Isaac Newton Telescope, and Gran Telescopio de Canarias and on locations in La Palma, opened on 12 July at the Museum of Contemporary Art of Panama. It had previously been on exhibit in Madrid and at two cities in Mexico. Light Years explores the cycles of space and time and the role of atomic physics in revealing the nature of the universe. It includes the film 'A glimpse of the Universe', a dialogue of the artist with ING Director Marc Balcells on astronomy's quest for the size and age of the universe. Light Years exhibit web site.